Recently my friend Joey (the creator of Good Morning Gloucester, the blog for which I am a daily contributor) was contacted by The Field Museum in Chicago about a GMG post from May 2012. They were interested in acquiring an image of mine from a post about our beautiful HarborWalk Tulip Trees, planted at St. Peter’s Square. The Field Museum is currently developing an engaging new scientific exhibition on the topic of Biomechanics that will debut in the spring of 2014. Led by the curatorial efforts of Field Museum Curator of Zoology, Dr. Mark Westneat, the exhibition will explore the science of looking at living things as machines built by nature and evolution. One of the topics presented includes wind and how the leaves of a tree change in the wind. I selected Tulip Trees for the gardens not only because they have a lovely ornamental bi-color effect when the leaves catch the wind, but primarily because they have a storied connection to Gloucester history. Liriodendron tulipifera was one of the primary woods used for tall ship’s masts, and because much of the wood from which the CB Fisk organs are built is Tulip Poplar (thank you to Greg Bover for the information about the Fisk connection to tulip poplar!). Tulip Trees are also a caterpillar food plant for the Eastern Tiger Swallowtail butterfly! 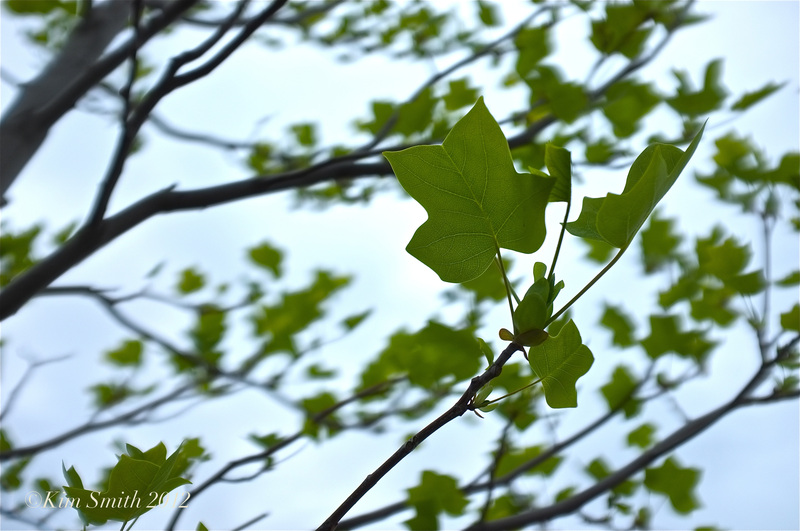 See post about Tulip Trees ~ Welcome Tulip Trees! This entry was posted in Butterfly Garden, Cape Ann, Creating a Butterfly Garden, Gardens at Gloucester Harbor Walk, Good Morning Gloucester, Home and Garden, Lepidoptera ~ Butterflies, Skippers, and Moths, Swallowtails and tagged Butterfly garden, Gloucester HarborWalk, Liriodendron tulipifera, Swallowtail caterpillar host plant, Tulip Poplar, tulip tree, Yellow Poplar on September 16, 2013 by Kim Smith.